As fall closes in, the excitement for masquerades increases. We all want to be present at a luxury night party prompting everyone to have the wish to uncover us to find out who hides under the stupendous mask. Well, no one could ever create a better weapon for this mission than the Italian luxury design house Bulgari. The two brand new Bvlgari luxury bejeweled eyewear lines released by the fashion house are beyond the greatest expectations of ours. They are a special kind of tribute to the brand’s motherland ” Italy, Rome and Venice, to be more precise, and this is not a new step: we have had the honor of being the evidence of the design house creating luxury pieces dedicated to Rome or inspired by Venice. The first line is called High Jewelry Diva and is dedicated to the Eternal city. The one and only piece of this line is the pair of exquisite cat eye sunglasses of an unexpected blush color. It is trimmed with a semi-transparent rim wholly made by hands from acetate. The side edges of the rim are diamond encrusted and adorned with precious pavé from pink gold. The diamonds are set in a way to create an illusion of fans, which remind us of the mosaic décor of famous Roman baths. We could easily imagine an unforgettable day in the temple-like buildings of Roman baths with the gentry or royal families speaking of high topics beyond imagination and enjoying every second of being there. 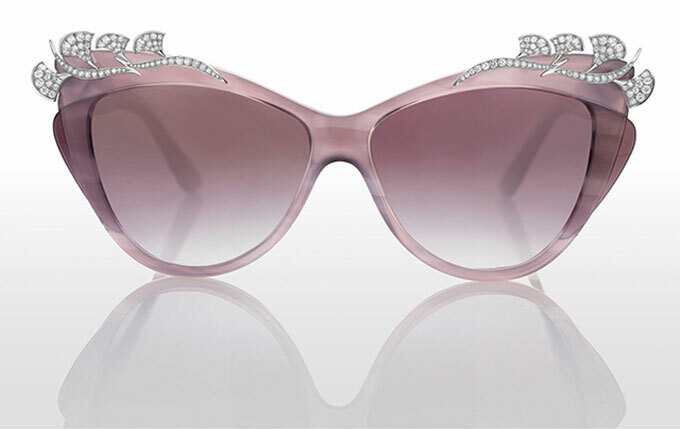 These Bulgari sunglasses are undeniably so powerful as to inspire us to imagine that all. We wish there were more pieces like this in the line, though its splendor is inestimable even alone. The second line, which is called Pazzi per Venezia, is dedicated to another iconic Italian city ” the Queen of Adriatic Sea ” and the chief extravaganza of it ” the Venetian Carnival. 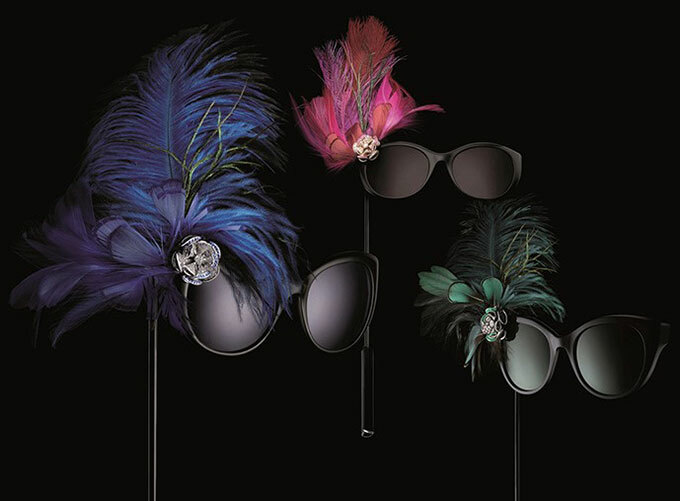 The collection comprises three unique sunglasses, which look more like carnival masks. 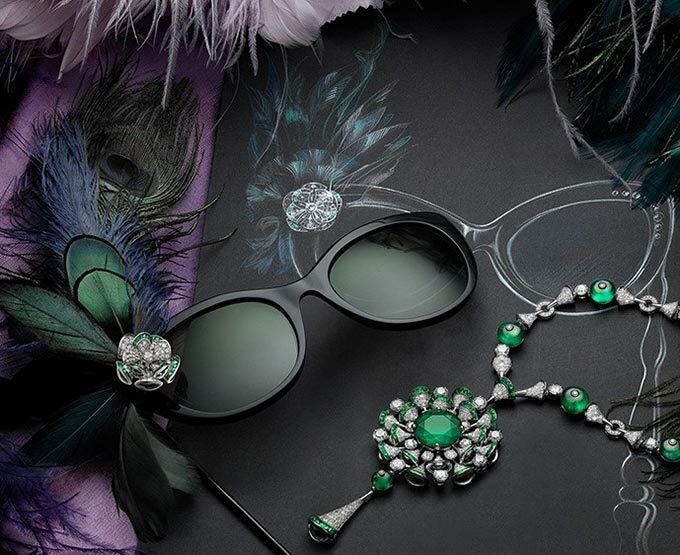 Each of these boasts a heart-shaped diamond along with sapphires and emeralds in a brooch, which is stuck on the outer corner of the sunglasses paired with rich feathers that as we know are the signature features of carnivals. Of no less interest is the side stick that gives the wearer the opportunity to keep it in hand exactly like a Venetian mask: this old-movie inspired solution is really thrilling making us feel special, authentic and splendid. How blessed would one feel when she obtains one of these: we all know that the precious or, better say, priceless pieces of luxury are so exquisite also because they are limited in numbers and variations. Bulgari is in the group of LVMH and is known as one of the three major jewelry-producing companies in the world. Seeing these new lines of luxurious mask-like sunglasses we instantly plunge into a sweet dream imagining us in a Venetian carnival surrounded with the greatest people, all of them wearing these luxury pieces.